Visitors from around the world head to Canada to explore the trails, and with good reason. Canada's land plus the freshwater area is 9,984,670 square km (or 3,855 174 square miles). That's a lot of hiking. More than just quantity though, the country's vast lakes, mountains, forests, and wildlife offer inescapable opportunity to witness sublime natural beauty. In addition, an effective network of government agencies, including Parks Canada, is committed to protecting and sharing some of Canada's most scenic green space. Camping, hiking, and boating in Canada are all easy to navigate and safe if you stick to the managed areas. Here are 10 classic Canadian hikes that won't let you down, but they are just the start. Not for the faint of heart, the West Coast Trail is arguably Canada's most famous hiking trail. Part of Pacific Rim National Park at the edge of Vancouver Island, this 75 km trail takes you through rainforest, coves, and beaches, offering spectacular views of the Pacific Ocean and passing whales if you're lucky. A quota system limits the number of people who can be on this trail at one time, not to mention the steep reservation cost. Also steep is the hike itself, with numerous stairs and ladders to navigate. Combined with slippery conditions, this trek can be grueling. Takes 5 to 7 days. Nearby day hikes make a nice, less challenging alternative. Ontario's crown jewel of provincial parks, Killarney Park was made famous by Canada's Group of Seven, who not only immortalized the park's landscape in oil painting but convinced the Ontario government to designate it as protected parkland. Good thing; today Killarney welcomes thousands of visitors every year to explore its trails, including the picturesque Granite Ridge Trail that gives stunning views of La Cloche Mountains, pristine Georgian Bay and windswept pines that defy the elements. You can day hike at Killarney or reserve a campsite with Ontario Parks. Reservations can be done 6 months in advance and fill up early. There are so many crazy breathtaking ways to take in the Rocky Mountains that it's hard to recommend just one; however the "Plain of Six" truly delivers some scenic bang for a moderate hiking buck. Complementing the hike are tea houses at the Plain of Six Glaciers lookout point and at the end of the trek. This is a popular hike, especially in that it can be done in a day. Cape Breton is a glorious part of the maritime province of Nova Scotia where stunning, dramatic scenery plays host to some of the country's most laid-back friendly people. Cape Breton Highlands National Park offers the chance to intimately explore the northern part of the region, whether on a comfortable stroll or more challenging hike. Both types of hikes present stunning canyon and ocean views. Camp overnight or visit for a day hike. Considered by many to be the best multi-day trek in the Canadian Rockies, the Sunshine to Mt. Assiniboine trail takes some planning but is a suitable trip for families. Alpine meadows, lakes, mountains, mountain goats, bighorn sheep, and elk are just some of the sights on this hike. Traversing two provinces (from Alberta to British Columbia), this trek has you dealing with three organizations for passes, etc. Despite the paperwork, associated fees, and pesky insects and bothersome bears (no joke), it's still one of the world's most popular treks. This hike takes about 5 days. The Bruce Trail is cherished by the people who live around it as a protected respite in the most populous part of the country. In some places, the trail cuts right through golf courses or next to roads. Canada's oldest and longest marked footpath and a Unesco World Biosphere Reserve, the Bruce Trail traverses 885 km end to end and 400 km of side trails in Ontario, from Niagara to Tobermory. Completing the whole trail on foot would take about 30 days, but the Bruce Trail Conservancy website provides detailed descriptions and maps of day hikes and camping trips. Woodland, wildlife, and waterfalls are all in abundance all along the way. The Bay of Fundy extends from the northern coast of Maine into Canada between New Brunswick and Nova Scotia. Twice daily, the Bay fills and empties its 100 billion tonnes of water, creating the highest tides in the world—in some areas of the bay, tides reach more than 50 feet (16 m). The tidal action has created a dramatic landscape of steep cliffs and sea stacks in addition to drudging up a plethora of fossils and interesting aquatic signs of life. Multiple trails around the Bay of Fundy offer intense, multi-day hikes or less arduous day hikes. Bay of Fundy Tourism has detailed hiking maps and descriptions. The 540 kilometres (340 mi) East Coast Trail in Canada's most easterly province of Newfoundland & Labrador takes you along the Atlantic Ocean's edge, through coastal towns—including the remnants of La Manche, a town obliterated by waves and rain in the 1960's—past fjords, sea stacks, crashing waves and craggy rock face. Part of the joy of the East Coast Trail is visiting the communities it links. The beauty of the Newfoundland landscape is a fitting backdrop to the charm and friendliness of the people. Hike for a day or even better, make a multi-day trip of it. With more than 3,000 km of coastline on the St. Lawrence River, it's not surprising that Gaspésie National Park boasts some striking hiking trails. Climbers especially will appreciate the two mountain ranges that converge in the park and create some beautiful scenes of mountain meeting water. Hikes range in length from 1 to 17 km or go big with the 100 km backpacking trek, but be prepared for snow, even in summer. You're that high. 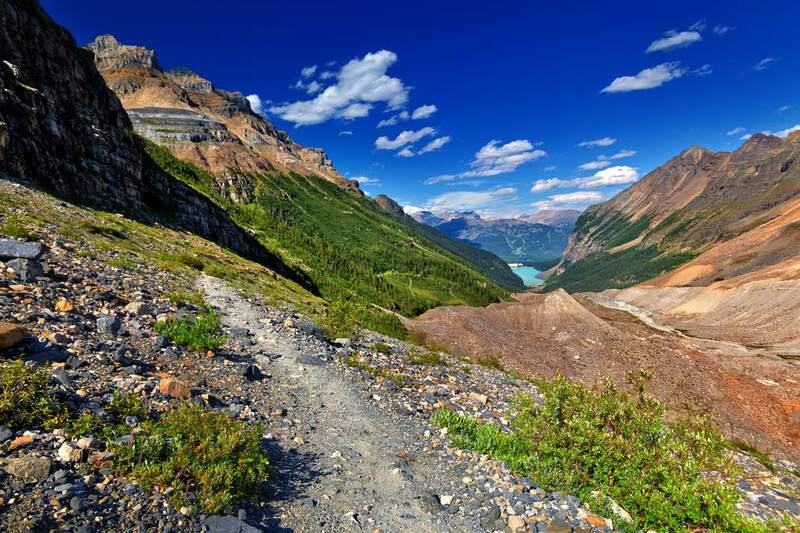 We're finishing off our list of great Canadian hikes with one of the most challenging: the Canol Heritage Trail in the Northwest Territories. A thoroughly remote trail, it has no developed campsites or facilities but you will come across abandoned trucks, pumping stations and telephone poles left over from the route's original purpose supporting an oil pipeline during World War II. Allot about 20 days to hike the entire trail. This trek is recommended for strong, experienced wilderness hikers. Warnings to beginners abound on anything you read about hiking the trail.